• 1052.3 sqft , 2 bath , 2 bdrm single story – FOR SALE USD190,580 . Pre-Construction Prices! Have you been shopping for condos for sale in Tulum, and not finding what you like? Have you looked at a lot of overpriced Tulum real estate, or under built poor quality Tulum condos for sale? 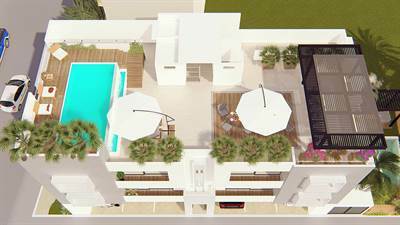 If you are looking for well constructed and affordable condos in Tulum, this is the place. Itzen condos in La Valeta Tulum. Hurry now, there are only 6 in total and at these prices, they truly won’t last long. Built by one of the architects who built the renowned El Taj condo hotel in on the beach in Playa del Carmen, the most successful boutique hotel in Playa, now you can own same quality of construction for a condo in Tulum, at prices that make Tulum real estate within reach. IN the emerging part of Tulum, La Valeta, this is where you will find value Tulum condos and homes for sale and “Itzen Condos Tulum” is leading the way. As there are 6 condos in total, this will be a quiet building, lending itself to the snowbirds of the north who want to be in the warmth and friendliness of Mexico for residential or rental for those wishing to reside in the area or rent it out to long-term tenants. You will have no trouble renting these condos at good prices for vacation rental or long term. Kitchens will have marble granite tops, and refrigerator and stove top are provided. The rooftop has a common swimming pool and bbq area and shade for hanging out. Ground level has parking for each car and garden level and a feature waterfall. Discounts for early bird buyers. Call us today for a viewing of these super condos for sale in Tulum. PB / Ground floor = 2 x 1 bedroom condos with Terraza. 1st floor = 2 x 2 bedrooms each with Terraza. 2nd floor = 2 x 2 bedrooms each with Terraza. These pre-construction prices won’t last! Call us now for more information.